The mobile oil station CMM-1,0 (hereinafter referred to as plant, unit, station) is designed for removal of solids and water from electric insulation oils, with viscosity not exceeding 70 cSt at 50 °С. 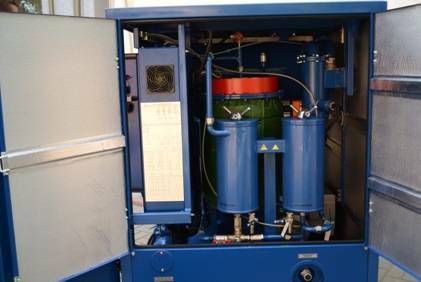 The station can purify oil to purity class 9, starting from purity class 13 (mass content of contaminants no more than 0.004%) if the substance purified repeatedly passes through filtration block. The plant is used during mounting, maintenance and operation of oil-filled high voltage equipment (power transformers, high-voltage switchgears, etc.). The station is a frame structure with closing doors. 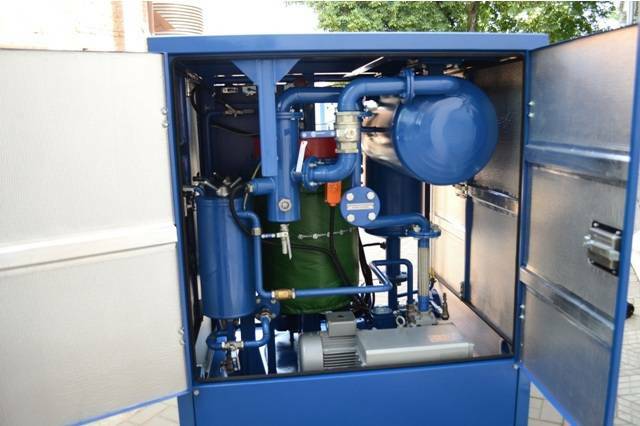 Its components: vacuum column 1, composite control unit CCU 2, oil pumps 3 and 4, vacuum pump 5, prefilter, coarse cartridge filter 6, 7 and fine cartridge filter 8, pipeline system 11 with gate and control valves are installed on the frame. The general view of the station is shown in figure 1. Mesh filter MF 6 is installed at the input of the unit to remove mechanical impurities from the oil. Filtration rating of the filter is defined by 200 micron brass mesh, fixed in the casing. For filter element washing, it is necessary to take the filter from the input manifold and wash it in the clean transformer oil. Pumps Р1 and Р2 – installed for input and output of transformer oil. Pumps are controlled from the composite control unit. The pumps are equipped with by-pass line and valves V7, V8. Cartridge filters F1, F2 (figure 6) are designed for filtration of the treating oil. Filtration fineness is 5 mcm. General view of the filter is given in figure 2. 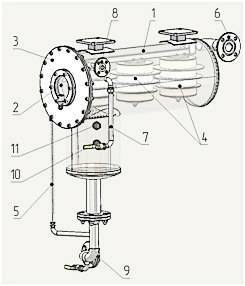 Figure 2 – Cartridge filter: 1 – oil input line; 2 – filtered oil output line; 3 – contaminant drain valve; 4 – filter element; 5 – air vent plug; 6 – magnets; 7 – clamp It consists of a cover and a case, where filter elements of EFMG type are installed. The cover is equipped with a plug for air outlet, when the filter is filled with oil and for air inlet in case of oil draining of the filter. In the bottom of the filter it is designed a manifold with a valve. Oil input and output lines are welded to the case. 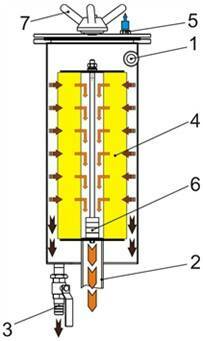 Vacuum column CV (figure 6) is designed for heating and drying of transformer oil. General view of the vacuum column is shown in figure 3. 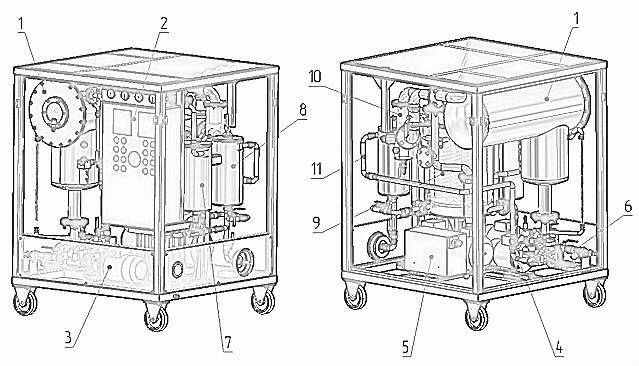 Oil heater is a thermally insulated cylindrical container with electric heaters inside (12 pieces electric heaters with power of 1.2 kW). To prevent overheating, there is a sensor for measuring and regulation of temperature on outlet of the heater. 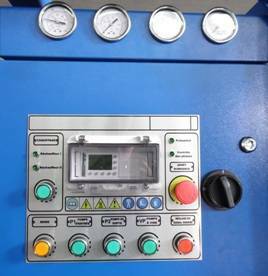 light indication on the CCU front panel shows whether heating elements TEH are switched on/off. 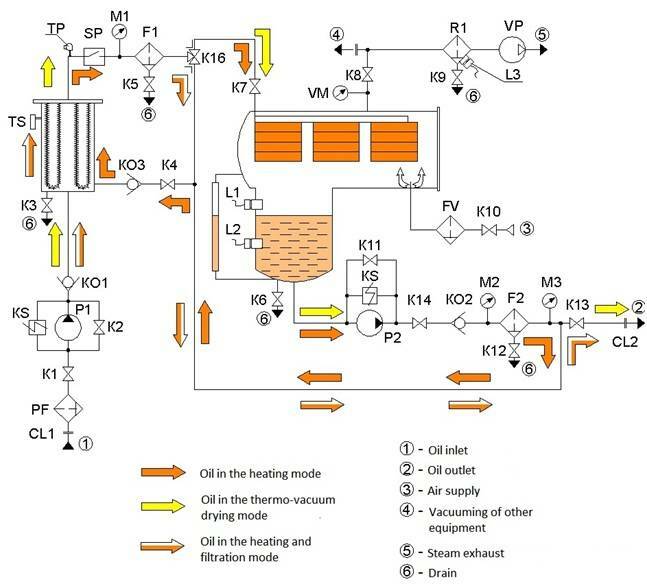 Filtration with pre-heating and thermo-vacuum purification.